I have had a love-hate relationship with bags. This post could very well go down like my fashion post, revisiting my mishaps but I don't have enough pictures to do it. I think the love-hate relationship with bags started because I was such a tom-boy. It was difficult for me to embrace my feminine side. I was so busy on the heels of my older brother, desperately attempting to keep up with his accomplishments that I tried to do everything like he did. Eventually, I grew out of the tomboyishness into full femininity. These days I absolutely adore handbags. With all the moves I've done in the last year, I have had to downsize significantly! 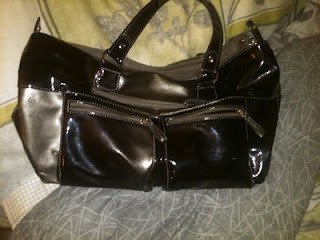 My everyday bag is a messenger bag... black, over-the-shoulder, four pockets. Right now it contains my pocketbook -- it's equipped with all my credit and debit cards, library card, frequent shopper cards, old receipts, no cash, a little bit of change, drivers license, and that's it. This is my bag of choice if I need something better than my "everyday bag". I watch those reality shows like The First 48 where detectives attempt to solve a murder within the first 48 hours after the discovery of the victim. I wonder, if I were a victim, what would my purse say about me. What are some of the things they would "deduce" about my lifestyle. They'd read the weight on my license and know that I was a liar (figure that one out). Ummm... according to the receipts (I just looked at them) they would be able to know my whereabouts at specific times within the past week. They would also deduce that I like to eat, since most of the receipts are for groceries or from a restaurant. They could check my reading list from the Public Library. That's really about it. They wouldn't be able to tell much about my personality. Or could they? What would the contents of your bag say about you?